Despite a humble birth in a small farming village in northern Italy, Guercino worked his way up to the employ of the pope and then became the leading painter of Bologna. Known from childhood by the nickname Guercino ("the squinter") because of his cross-eyed appearance, he was the era's most prolific and eloquent draftsman. In addition to preparatory drawings for paintings, he drew landscapes, momentary sketches of everyday life, and even caricatures. Favoring pen and ink to record fleeting glimpses of activity, Guercino preferred to use flexible feather-quill pens, and he probably made his own inks from fireplace ashes or from insect galls on trees. The ink on this sheet was so acidic that it ate away the paper where the drawn lines were densest. 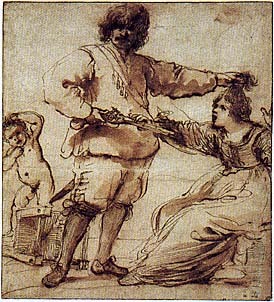 The present drawing for many years called The Enraged Husband, has a spontaneous, anecdotal quality common to many of Guercino's sketches. It is likely that it represents a scene from a popular play.